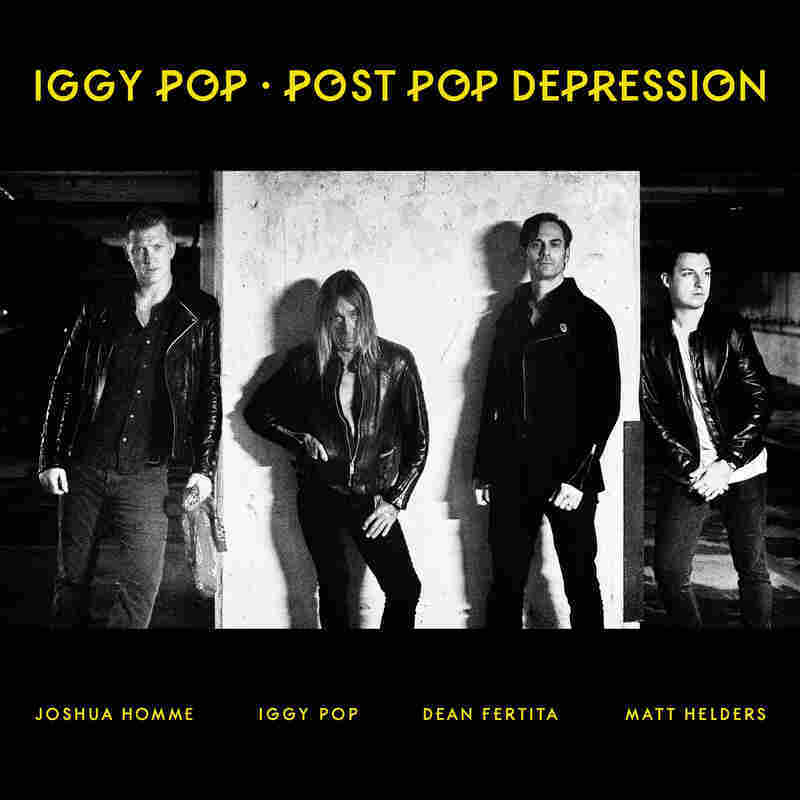 Review: Iggy Pop, 'Post Pop Depression' The rock legend's new album with Queens Of The Stone Age's Josh Homme is all sharp angles, hard muscles and decadent ecstasy. Given Iggy Pop's recent announcement that he may be retiring from the music business, it's been an introspective time for the rock giant. That might be part of why Pop's new album — a collaboration with Josh Homme — bears the title Post Pop Depression. Not that the album itself is quite as ominous as its name. Throughout its nine songs, Pop pipes in his most unctuous croon, a work of nature that's only become more monumental as it's eroded over the decades. But with Homme's acumen as the architect of Queens Of The Stone Age stirred into the mix, there's decadent ecstasy to the album that's as far from glum as you can get. It is heavy, though. In addition to producing and co-writing Post Pop Depression, Homme provides guitar, bass, piano and backing vocals; also in the group are guitarist Dean Fertita (Homme's right-hand man in Queens Of The Stone Age, as well as Jack White's bandmate in The Dead Weather) and drummer Matt Helders of Arctic Monkeys. With that kind of lineup, it's clear that this isn't going to be any kind of retirement party, and Pop obliges his younger cohorts' zeal with plenty of his own. The album is all sharp angles and hard muscles, from the choppy, stomping riff of "Break Into Your Heart" to the splintered rage of "Paraguay." "I have nothing but my name," Pop intones at the close of "American Valhalla," his voice a study in smoke and gravel. For a man whose musical fortunes have seen many peaks and valleys — during some stretches of his long career, it has indeed felt as if Pop's name was all he had going for him — it's a chillingly vulnerable confession. But even when he lets out some morbid paranoia during "In The Lobby" ("My shadow is walking in front of me / And I hope I'm not losing my life tonight"), he seems more like a predator than prey. Still, he never lets the album get too pensive. His spoken-word, expletive-laden, anti-laptop rant in "Paraguay" is the kind of get-off-my-lawn stuff that Pop has more than earned the right to unleash. But for every glimpse at the punk of old, Pop drops tender moments like "Gardenia," a lush, catchy love song that's also ever-so-slightly eerie. The most sentimental moments, though, come when the band is clearly channeling Pop's high point as a solo artist: his collaborations with David Bowie in Berlin on the classic '70s albums The Idiot and Lust For Life. "Sunday," for instance, unabashedly recalls that era with its skeletal yet punchy drumming, sculpted guitar and avant-garage edge. In "German Days," the record's most flagrantly nostalgic song, Homme and his team tap into the decadent, wiry menace of the Berlin albums while Pop glances back with rueful irony at Lust For Life: "When your love of life is an empty beach / When it's painful to express the things you feel." In lesser hands, that might come off as self-parody, but instead, the singer sounds like he's owning his legacy — and having a good time doing it, introspection notwithstanding. If Post Pop Depression does end up being Pop's last recorded hurrah, it's a worthy one.